In a wide bowl add the ragi flour(finger millet flour), finely chopped onions, salt, finely chopped green chili and finely chopped curry leaves. Boil 1 and 1/4 cup of water till it comes to a rolling boil. Add the water slowly to the ragi flour. The flour depending upon the texture will absorb water approximately around 1 and 1/4 cup to a 1 and 1/2 cup. Using a spoon mix the flour well. Mix well and make it into a sticky dough. Grease your hands and knead it into a soft dough. 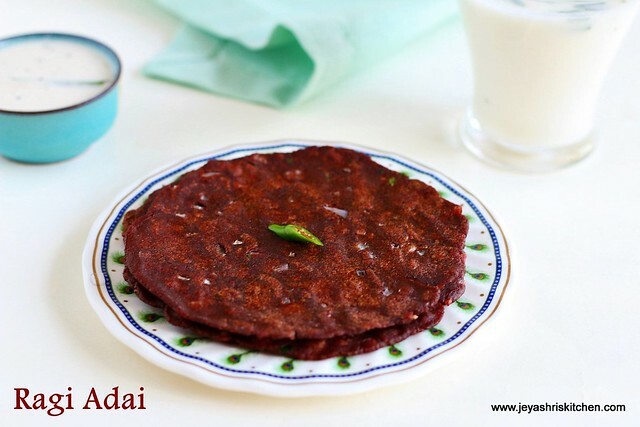 It will be slightly sticky, if you make it tight, the adai will break while making and end up in dry adais. Grease a ziplock cover and grease it with a drop of sesame oil or you can use a banana leaf too. Place a big lemon sized ball on it and flatten it. Grease your hands with little oil and make it as a thin roti with your hands. Heat a tawa and when it is hot, slowly take out the adai which you flattened by inverting the cover on you hands. Do not worrry, it will easily come out. If using banana leaf you can invert it directly on the tawa and slowly take out the leaf. Place this on the hot tawa and cook it on both sides. It will take time for the adai to get cooked. Keep it in a medium low flame. When both sides are cooked completely, add few drops of oil and take it out from the tawa. Serve it hot with any chutney of your choice. I had with my favorite coconut chutney. Repeat the same procedure for the rest of the dough. 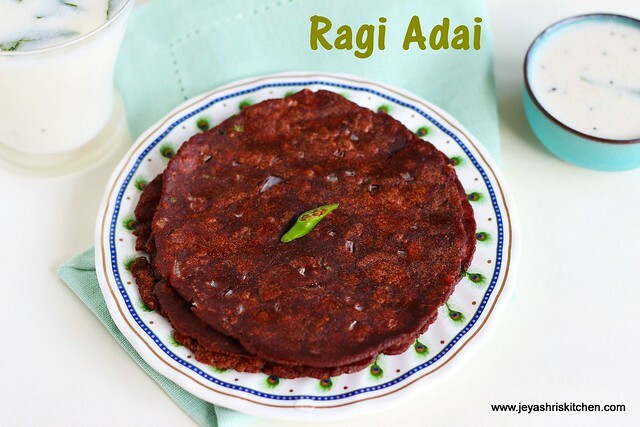 As amma always says ragi generates body heat, have it with a glass of buttermilk. Always use hot water to knead the dough. It will give the perfect texture for rotis. Chop the onions, green chilies very finely so that you can pat the adai easily with your hands. Do not make the dough too dry, let it be slightly sticky.